Arising as one of the most popular Olympic sports, Taekwondo offers a broad range of opportunities. 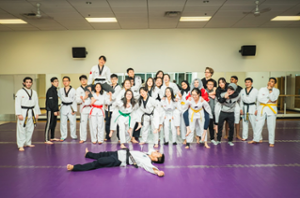 The Western Taekwondo Club emphasizes self-defense, street techniques, sparring techniques, board breaking techniques, patterns, philosophy, and more! We strive to have a great atmosphere, and welcome enthusiasts and beginners alike. It’s a great way to condition your body, grow spiritually, compete at tournaments, partake in social events, and have fun! 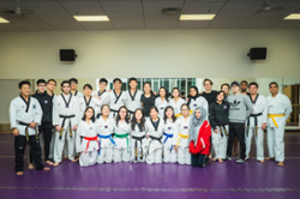 Hi Western, my name is Jai, I’m a 4th year business student, and I’m the president of Western Taekwondo for the 2018/2019 school year. I’ve been doing taekwondo since grade 8 and I’m currently a 2nd Dan black belt. I joined Western Taekwondo in my first year and I’ve been able to meet some of my best friends through the club since. Outside of taekwondo, I really enjoy travelling and landscape photography. Western Taekwondo is second family to me, and we welcome people of any skill level to come take part and have some fun! At Western Taekwondo, we try to provide as many unique opportunities as possible and try to incorporate both taekwondo related, and non-taekwondo related events into our planning in order for our members to get the most out of their time here with us. Every month we host club socials, where we encourage anyone who is interested to join us outside of class times and hang out. Our socials range from apple picking, to going tubing, or just hanging out all together at a member’s house. Every summer, we also plan a few camping trips which are always a fun time. We like to think of ourselves as a big family, and sometimes we’ll spontaneously decide to hang out or go for dinner after practices. 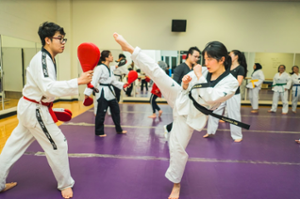 Asides from socials, we also provide members the opportunity to compete in two tournaments in Toronto every year, and we host joint trainings with other universities and taekwondo academies. 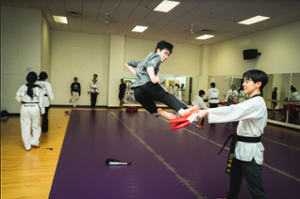 We encourage people of any level to participate in the tournaments and trainings—it’s a great opportunity to try something new even if you’ve never done taekwondo before!